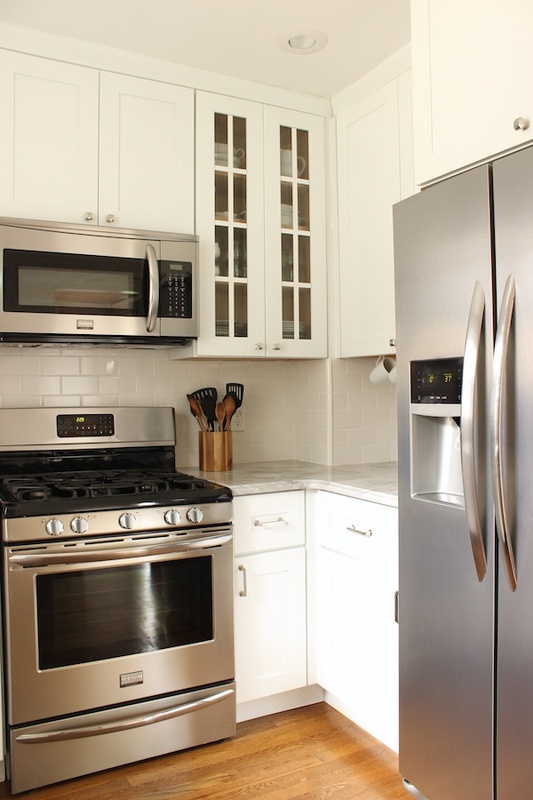 I'm so excited to finally share my new kitchen! 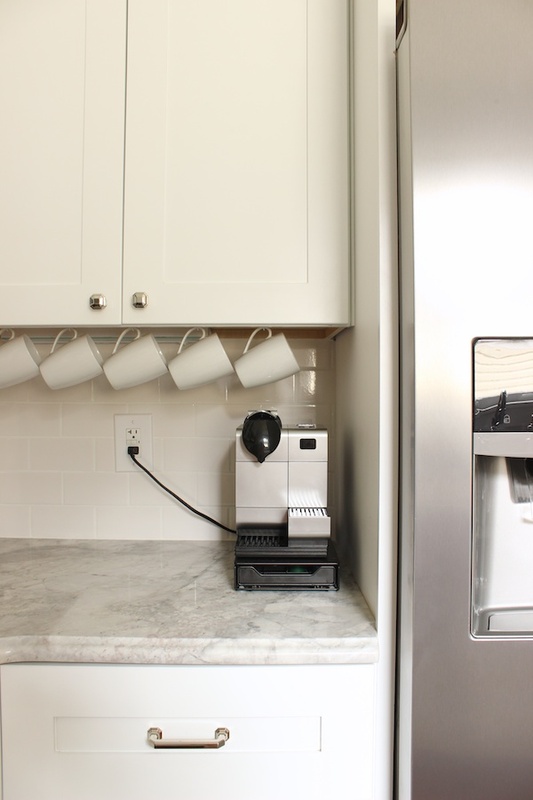 Honestly, one of the biggest selling features of our new house was the fact that the kitchen was so bare-bones that we had no hesitations about starting all over, which meant that I literally got to create the kitchen of my dreams. Wha?! Read on to learn how we changed the layout and see lots more pics. By moving the doorway between the dining room and kitchen, we were able to gain some wall space for the fridge. 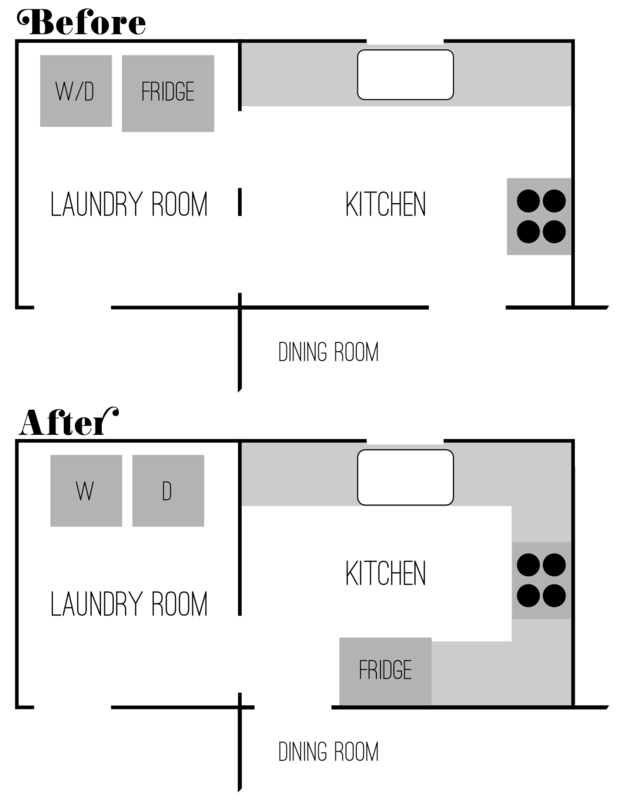 We also closed up a passthrough to the laundry room, which made things a little cleaner. In addition, we had the ceiling smoothed out and added in some recessed lights. As much as I would have loved to claim some portion of this work as my own, this, my friends, was no DIY project. 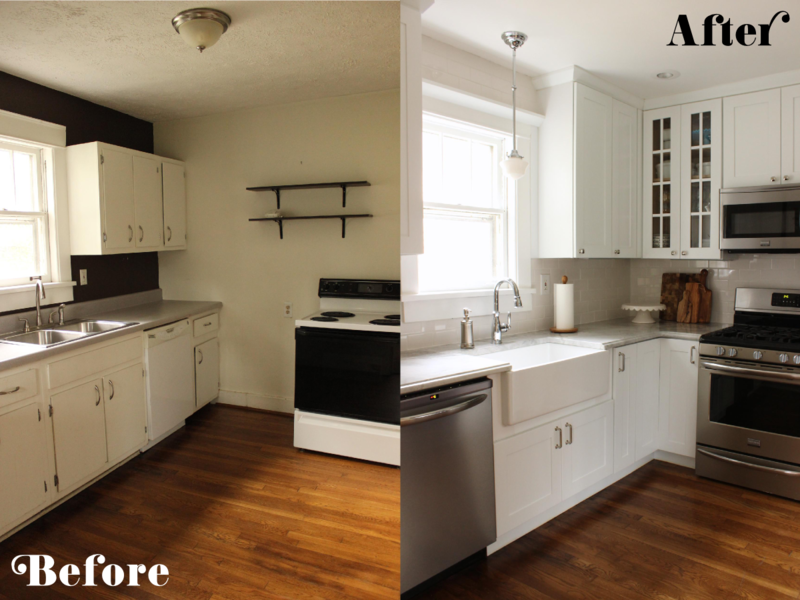 We worked with the great folks at Kitchen Makeovers on the design, cabinets, and countertops, and if you live around Nashville, I'd recommend them in a second. Actually, on that front, two things I'm obsessed with: the white shaker cabinets that go all the way to the ceiling (so much storage!) and the super white granite (look at that amazing veining!). Gah. On this foundation, though, I felt like I needed to bring in some elements that helped balance old and new. 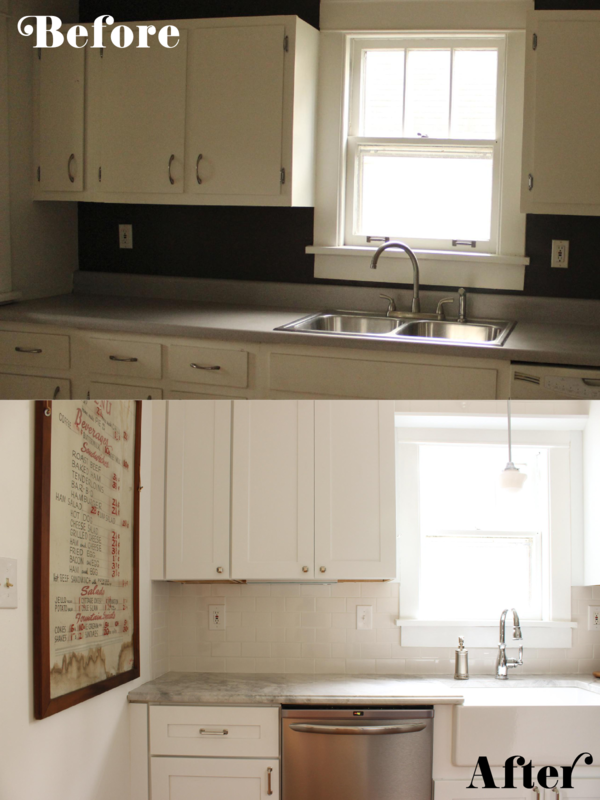 So, I went with an apron-front sink, a faucet and hardware with slightly more traditional lines, and a little schoolhouse pendant over the sink. Well, actually, there was one small DIY. 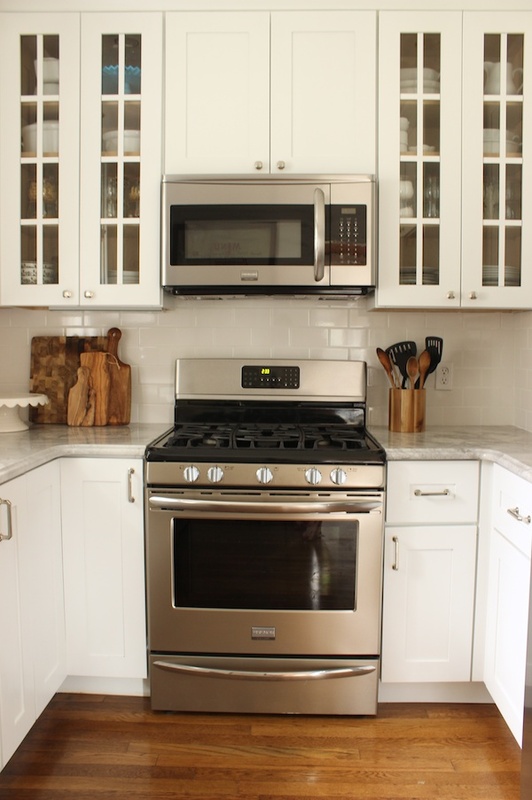 See that beautiful subway tile backsplash? My dad and I tackled that one -- one of many father-daughter projects in the house. What would you have done? Opened it up and left the fridge out in the laundry? 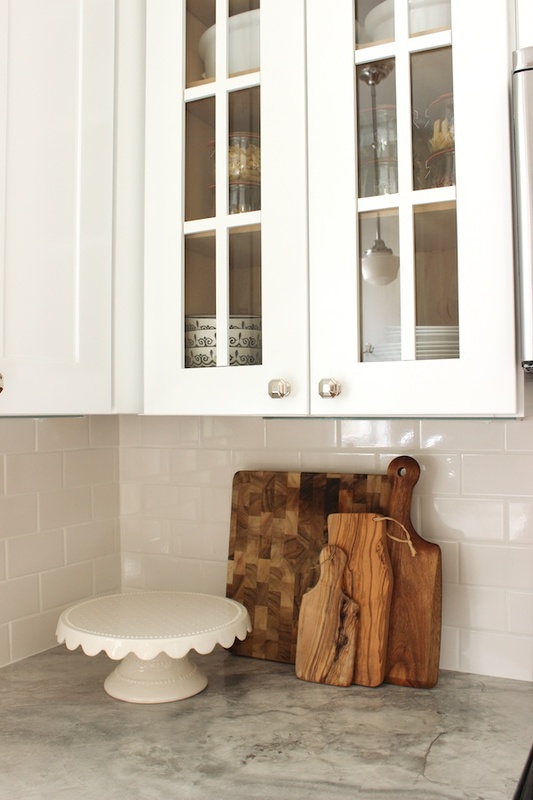 Or do you love galley kitchens as much as I do? Love it! Gorgeous colors. Did you need to refinish the floors? We did have to refinish the floors but only because we had to have the floor patched where we moved the doorway, and because of the way the planks run, we had one strip refinished into the dining room. 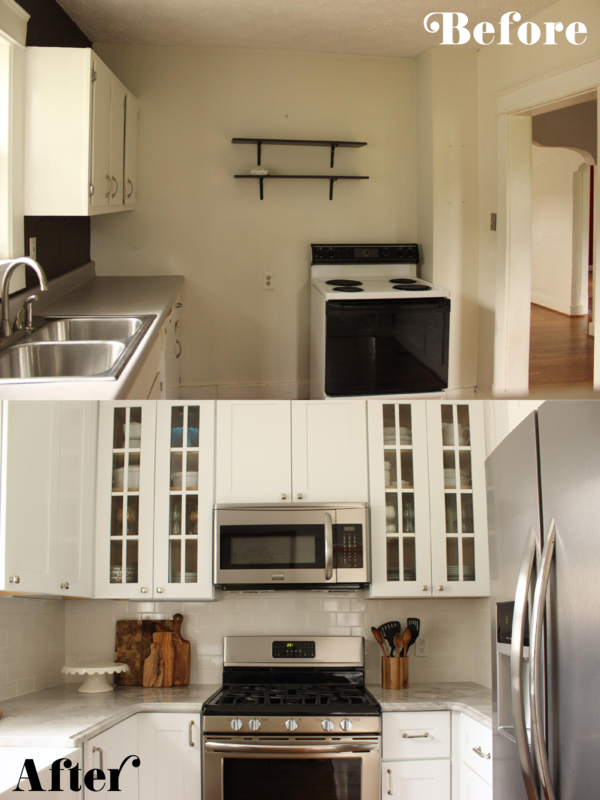 However, you can't tell much of a difference between the refinished and unrefinished areas. OH MY! I LOVE IT! That warranted caps. It looks amazing. 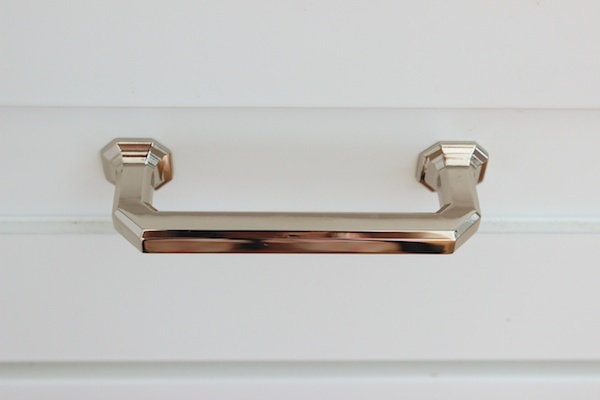 The cabinet hardware might be my favorite! Good job! It looks amazing! Beautiful space! 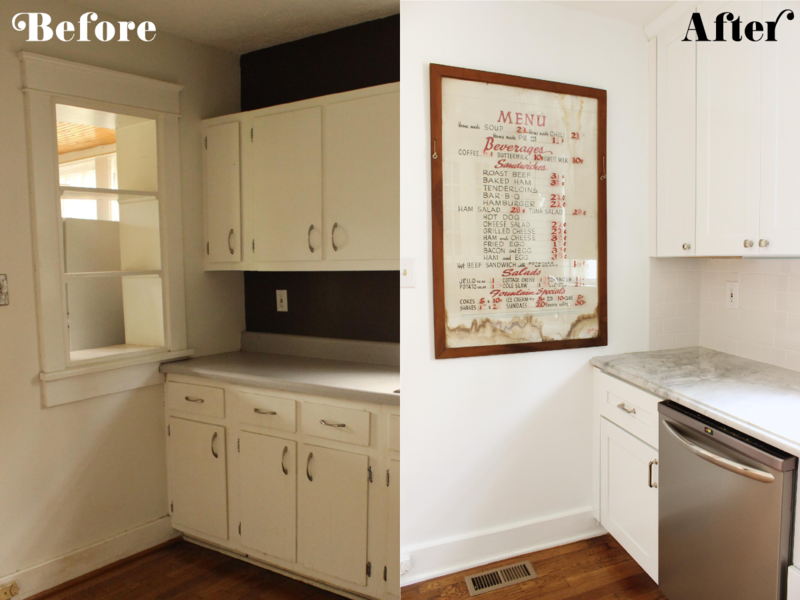 I have a galley kitchen as well that we totally re-did last year and I love it even more. Sometimes I feel a little jealous of friends that have big open kitchens, but if you actually cook in your kitchen, especially as much as I do, a galley is truly the best design. You've inspired me to take some updated pictures of my kitchen. TFS! Gorgeous kitchen! 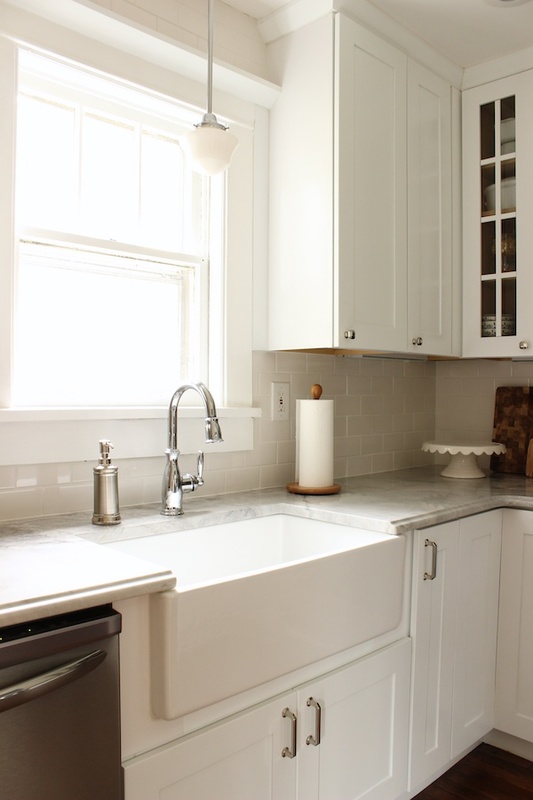 I love the cabinet fronts and the sink! I am curious - what material counter tops did you use? Is this marble? Glad you asked! 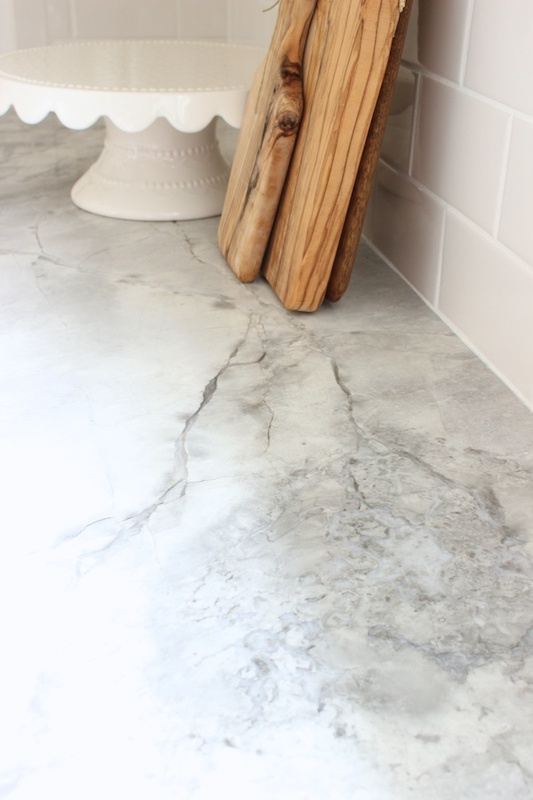 This was such a labored decision, because I love the look of marble but didn't want the price or maintenance of it. This is actually granite. The kind is called "Super White." Some of the slabs are pretty dark with a lot of grey, but I picked out a lighter one. I love it, and the veining is super interesting. Where did you get the light that hangs over the kitchen sink? I love it! Sure thing. I got it here. And good news, it's cheap! Sure thing! 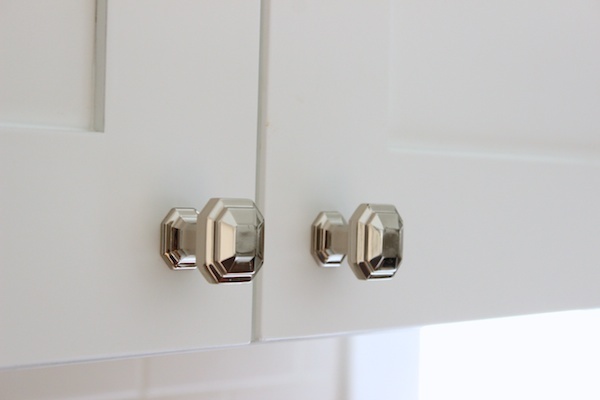 I ordered them from Amazon -- knobs here and handles here. Um, obviously I love your new galley. It's incredible! I'm beginning to wonder if you're really an interior design blogger disguised as a fabulous craft blogger.